Context: Asthma is a heterogeneous disease characterized by chronic airway inflammation that causes airway hyperresponsiveness. The diagnosis of asthma is mainly clinical, and chest X-rays are not required for the diagnosis or grading of severity of disease. Aim: The aim of this study is to look at the frequency of abnormalities and the pattern of abnormalities in chest X-rays done in children above 5 years admitted with acute asthma and to analyze if chest X-ray reports altered the ongoing treatment plan. Settings and Design: It was a retrospective study done in a tertiary care hospital. Methods: Data were collected from case records of children above 5 years admitted with acute asthma between November 2014 and October 2017. Statistical Analysis: The statistical analysis was done using Chi-square and Fisher's exact test. Results: A total of 114 children were included in the study, and 84 (74%) had chest X-rays performed of which 88% were normal. Nineteen (22.6%) complied with standard guidelines, and the reason for performing chest X-rays in these children was the presence of focal clinical chest signs. When there were focal clinical findings, the possibility that chest X-ray would be abnormal was 47.37%. When there were no focal clinical findings, the possibility that chest X-ray would be normal was 98.46%. The sensitivity of chest X-rays with clinical correlation was 90% and specificity was 86.48%. Hence, routine chest X-rays in the standard treatment of acute asthma are not necessary, especially when there are no focal clinical findings. Conclusion: Chest X-ray is not required in the management of acute asthma in children above 5 years responding to standard treatment. Chest X-rays should be ordered in the management of acute asthma only when indicated, thereby reducing unnecessary exposure to radiation. Asthma is a heterogeneous disease characterized by chronic airway inflammation that causes airway hyperresponsiveness. It is defined by the history of respiratory symptoms such as wheeze, shortness of breath, chest tightness, and cough that vary over time and in intensity, together with variable expiratory airflow limitation. The diagnosis of asthma is mainly clinical, and chest X-rays are not required for the diagnosis or grading of severity of disease. Chest X-ray may be valuable when there is an inadequate response to treatment, clinical suspicion of an alternative diagnosis, or complication of asthma. In routine practice, unwarranted chest X-rays are ordered frequently in the management of acute asthma. According to the current guidelines from the International Committee on Radiation Protection, the stochastic exposure risks increase in a linear, dose-response manner, and therefore, repetitive radiation exposures are believed to incrementally increase cancer risk in children. The radiation exposure for every chest X-ray is equal to 0.02 mSv (millisievert). Awareness is one of the greatest means to reduce radiation exposure. Our study was a retrospective observational time-bound study done in a tertiary care hospital. All children above 5 years of age admitted with exacerbation of asthma between November 2014 and December 2017 were included in this study. Children below 5 years and those children with diagnosis such as episodic viral wheeze, bronchiolitis, and wheeze-associated lower respiratory tract infection were excluded from the study. Data were collected retrospectively from case records of children fulfilling the inclusion criteria using a predesigned pro forma. Chest X-rays were reviewed by a consultant radiologist and compared against clinical findings documented in the case records. Notes were screened meticulously to see if chest X-ray findings altered the standard treatment of asthma and whether the X-rays done were in concordance with standard guidelines. Chi-square test and Fisher's exact test were the statistical methods applied. The study was approved by the Institutional Ethics Committee. A total of 114 children above 5 years of age admitted with acute asthma were included in our study. Sixty-five (57%) children were boys, while girls were 49 (43%). There was a history of recurrent wheeze for more than a year in 58 (51%) children, and 50 (44%) had a history of wheeze for more than 6 months but less than a year [Figure 1]. Out of 114 children, 84 (74%) had chest X-rays performed, while 30 (26%) did not have chest X-rays. Among the children who had chest X-rays performed, 19 (22.6%) complied with standard guidelines, and the reason for performing chest X-rays in these children was the presence of focal clinical chest signs [Figure 1]. Out of 84 chest X-rays which were performed, 74 (88%) were normal. Among 10 abnormal chest X-rays, 9 correlated clinically [Figure 1]. Consolidation with or without synpneumonic effusion was observed in nine and an incidental finding of a hiatus hernia was found in one. Focal chest findings were present in 19 out of 114 children. Chest X-ray was performed in all children with focal chest findings, of which 10 (52%) were normal. The possibility that chest X-ray would be abnormal in the presence of focal clinical findings was 47.37%. On the other hand, in the absence of focal clinical findings, the possibility that the chest X-ray would be normal was 98.46%. The sensitivity of chest X-ray abnormalities with focal clinical signs was 90%, while specificity was 86.49%, which was statistically highly significant (P < 0.001) [Table 1]. Standard treatment of acute asthma remained unaltered in 74 children with normal chest X-rays. On the other hand, in all the 10 children with abnormal chest X-rays, the standard treatment of asthma was modified (antibiotics in nine and surgery for hiatus hernia in one) which was statistically highly significant (P < 0.001) [Table 2]. Our study comprised 114 children above 5 years of age admitted with acute asthma. The results highlighted that chest X-rays were done in 84 (74%) children, of which 19 (22.6%) complied with standard guidelines. The presence of focal clinical finding was the reason for performing chest X-rays in children who complied with standard guidelines. Similarly, in a retrospective study done by Roback and Dreitlein, out of 298 children below 18 years admitted with acute wheeze, 121 (40%) had chest X-rays performed and 89 (73.6%) complied with standard guidelines. Localized wheeze, crepitations, and decreased air entry were the indications for performing chest X-rays in this study. In our study, chest X-rays were done in 84 (74%) children, and 74 (88%) were normal while 10 (11%) were abnormal. Although focal clinical signs were present in 19 children, 10 (52%) had normal chest X-rays. Correlation between clinical examination and chest X-ray findings was present in 9 (47.3%) children. In a single child with abnormal chest X-ray, there was an incidental finding of hiatus hernia. The sensitivity of chest X-ray abnormalities with focal clinical signs was 90% and specificity was 86.49%. In contrast, Brooks et al. 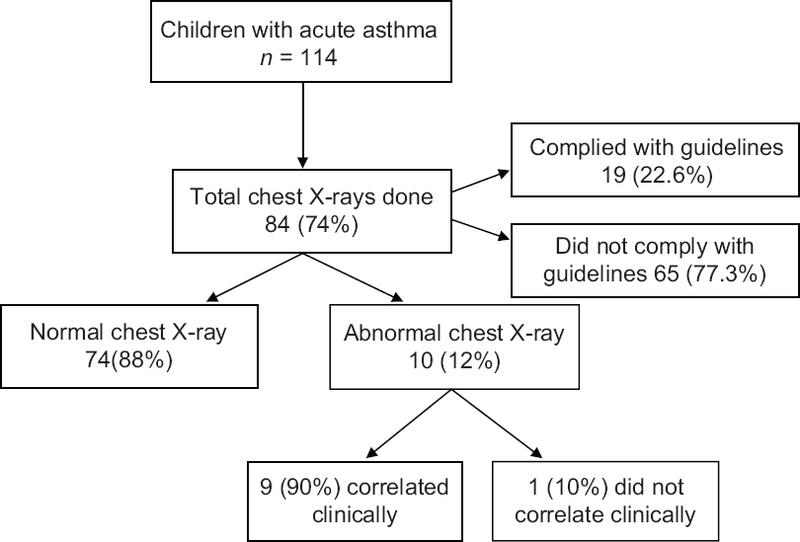 in their study on significance of chest X-rays in children with acute asthma showed that out of 128 chest X-rays that were performed, 36 (28%) were abnormal, of which 3 (8%) correlated clinically. In our study, 74 children with normal chest X-rays, the standard treatment of acute asthma was unaltered, while in 10 (100%) children with abnormal chest X-rays, standard treatment of acute asthma was modified (addition of antibiotics in nine and surgery for hiatus hernia in one child) which was statistically highly significant (P < 0.001). Similarly, Roback and Dreitlein showed that out of 121 children with acute asthma who received chest X-rays, 29 (24%) were abnormal and ongoing treatment was altered in all these children. In addition, clinical findings that influenced ongoing treatment were the presence of localized wheeze and localized crepitations in this study. In contrast, Brooks et al. in their study showed that out of 36 (28%) abnormal chest X-rays, treatment plan of acute asthma was altered in only 3 (8%), and hence, they had suggested that routine chest X-rays in the management of acute asthma were unnecessary. Chest X-ray is not required in the management of acute asthma in children above 5 years responding to standard treatment. Chest X-rays should be ordered in the management of acute asthma only when indicated, thereby reducing unnecessary exposure to radiation. The limitations of our study were that it was a retrospective study; hence, the reliability of data was solely based on the documentation in case records. The inclusion of cases was based on the documented diagnosis at discharge by the treating clinician. Children below 5 years of age were excluded as other clinical entities such as viral-induced wheeze and bronchiolitis may mimic asthma and diagnosis of asthma may be difficult. Spirometry and peak flow assessments are also difficult in this age group as they are effort dependent. The authors would like to acknowledge Dr. Sucharita Suresh for statistical analysis of data. Global Initiative for Asthma. Global Strategy for Asthma Management and Prevention 2017. Available from: https://ginasthma.org/2017-gina-report-global-strategy-for-asthma-management-and-prevention/. [Last accessed on 2018 Mar 01]. National asthma Council Australia. Asthma Management Handbook 2006. Melbourne (Australia): National Asthma Council Australia; 2006. Roback MG, Dreitlein DA. Chest radiograph in the evaluation of first time wheezing episodes: Review of current clinical practice and efficacy. Pediatr Emerg Care 1998;14:181-4. Brooks LJ, Cloutier MM, Afshani E. Significance of roentgenographic abnormalities in children hospitalized for asthma. Chest 1982;82:315-8. British Thoracic Society Scottish Intercollegiate Guidelines Network. 2016 British Guideline on the Management of Asthma 2016. Available from: https://www.brit-thoracic.org.uk/document-library/clinical-information/asthma/btssign-asthma-guideline-2016/. [Last accessed on 2018 Mar 01].